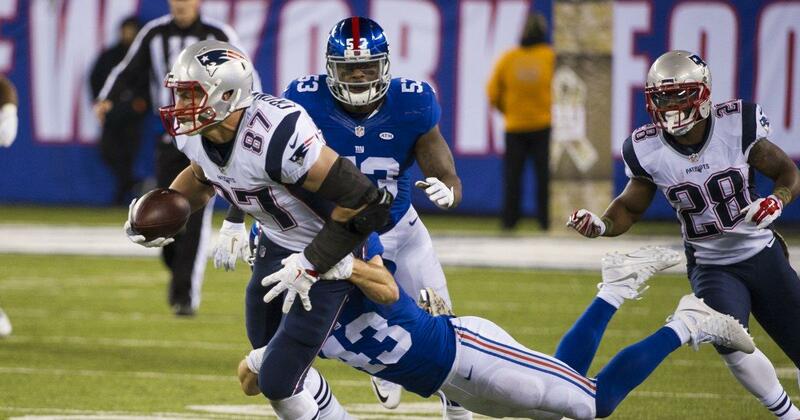 New England Patriots: A Giant Mismatch? Not Quite. | NFL News, as it happens, when it happens. Your one stop shop. New England Patriots: A Giant Mismatch? Not Quite. New England Patriot fans worldwide were worried that the 8-0 season was about to show a “1” in the loss column. After all, these were the NY Giants that ripped the heart out of fans in two Super Bowls as Eli Manning outperformed Tom Brady…they were kryptonite to Superman. Hell, the ‘Gints were the only team in the NFL the Patriots hadn’t beat since 2008! With the game played in MetLife Stadium, the Patriots offensive line still in shuffle stage and Jason Pierre-Paul confident he’d get to Brady to disrupt New England’s high-powered offense, an upset looked to be a given. Add in Odell Beckhams: ‘I’ve loved-hated the Patriots’ statement and you had the perfect setting for fans of the NY Giants…and then they started the game! It lived up to all the hype, as the final quarter determined the winner on the last possession as the clock ticked down. 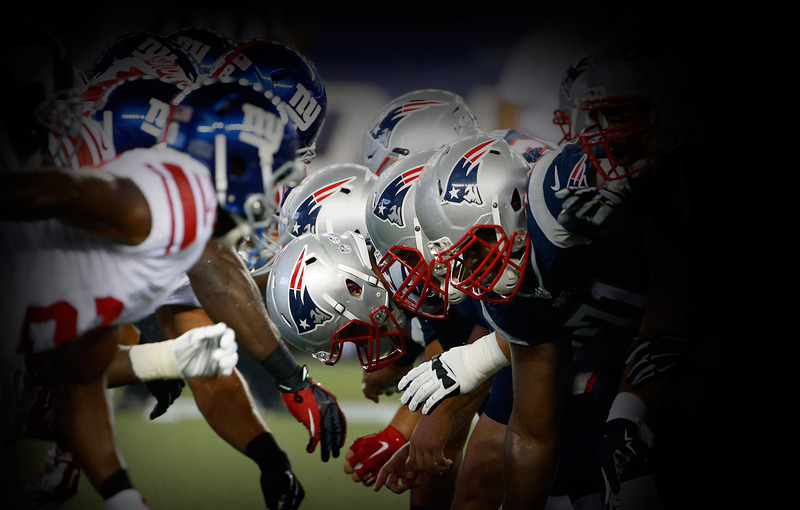 Patriots 27-Giants 26. Losing the coin toss (what’s going on here?) didn’t slow down the Patriots scoring streak as they drove 78 yards and ran off 14 plays in 8 minutes 25 seconds the first time they had the ball…culminating in a 1 yard TD pass to Scott Chandler. Split with 8 runs (including a 10 yarder by Tom Brady) and 6 passes, the TD extended New England’s scoring streak to 32 straight quarters, an NFL record. It didn’t take Eli Manning and the Giants long to knot things up as the New York QB connected on an 87 yard TD pass to Odell Beckham Jr., who beat Malcolm Butler in single coverage as he scampered into the end-zone untouched. It was the longest offensive play ever against a Bill Belichick coached team. After all the fireworks opening the game, things settled town with both teams going 3 and out before the Patriots took over on their 30 yard line with 3:29 left in the quarter. Following a short run by LeGarrette Blount, a 30 yard pass to Julian Edelman moved New England into NY territory as the quarter came to an end. Edelman limped off the field with a broken bone in his foot, putting a big crimp in an already struggling offense. 3rd and 4 from the 8 yard line brought pressure up the middle, bringing Brady down with the 1st sack of the game. Stephen Gostkowski kept his perfect season alive with a 31 yard field goal, moving him into a tie for the most FGs in Patriot history and putting the Pats up 10-7. The Giants proceeded to march down the field on their next possession before Manning was strip sacked by NFL sack leader Chandler Jones (10 1/2) and the ball was recovered by Justin Coleman at the Pats 16. With Edelman out of the game and the season long loss of Dion Lewis, the New England offense was stuffed. A critical Rob Gronkowski offensive pass interference call eliminated a 1st down and the Patriots were forced to punt from deep in their own end of the field. After a 51 yard punt and an 11 yard run back the Giants had great field position on their own 46. After their drive stalled at the Patriot 19, Josh Brown hit his 19th straight field goal and the game was knotted at 10-10. Reuben Randle grabbed a 31 yard pass from Manning at the Patriots 43 with a minute left in the half. Manning completed his 18th pass of the game to TE Will Tye and he rumbled to the 1 yard line. With 18 seconds left Eli lobbed a TD to a wide open Dwayne Harris and the Giants took at 17-10 lead into the second half. Manning had the most 1st half yardage of his career (251 yards) while completing 12 of 20 passes with two TDs. Brady, meanwhile, went 14-21 for 127 yards and 1 TD. History was rearing its ugly head as the Giants looked to continue foiling any bid New England had for a perfect season. The Giants received the 2nd half kick-off and once again exploited the Patriots secondary, including an interference call against Patrick Chung and another (highly questionable) by Malcolm Butler. The drive ended in a 38 yard FG by Brown (21 of 21) stretching the lead to 20-10, the largest deficit New England had faced this season. Josh Brown followed with a 53 yard FG, his 22nd of the season, putting the Giants up by 6, 23-17 as the 3rd quarter wound down. The Giants returned the favor they gave up in the 1st quarter with a strip-sack fumble of their own by Jasper Brinkley at the New England 39, but couldn’t capitalize on the turnover. The Patriots defense stepped up, led by a Rob Ninkovich sack, and forced the Giants to punt keeping the game within one score. The stop looked to be the turning point of the game, as the Patriots took over after the punt deep in their own territory. Gronk stepped up and caught the longest pass of his career with a 76 yard TD. The extra-point was good and suddenly New England was ahead 24-23. With the win staring them in the eyes, Tom Brady made his 3rd mistake of the quarter with a fatal interception at the Giants 1 yard line. 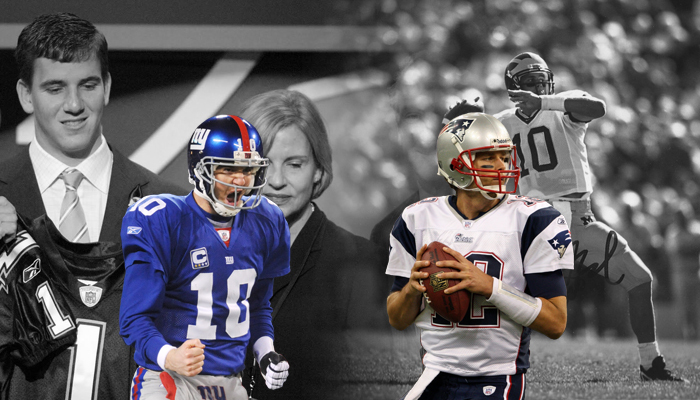 Manning had his chance once again to stick a dagger in the heart of Patriot fans…and he did just that. On a 3rd and 3 he hit a wide open Harris for 30 yards at the Patriots 28…well within Brown’s range. Another Manning to Harris pass put the ball at the Pats 5 with just over 2:00 left in the game. 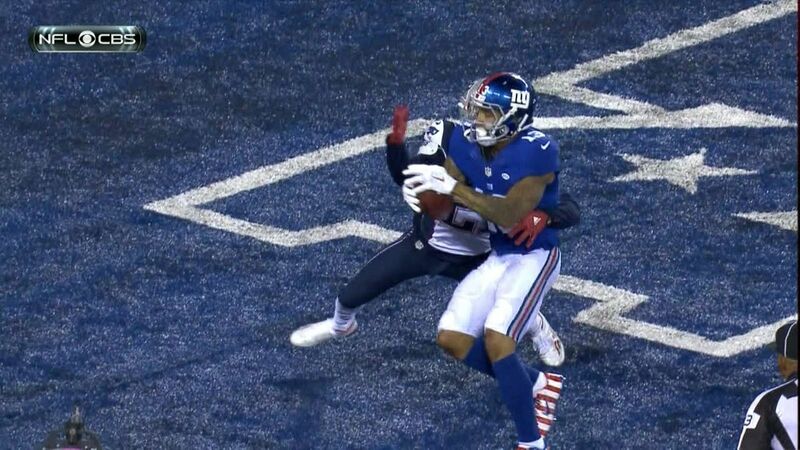 The Patriots caught a break when what was originally called a TD pass to Beckham was overturned on replay as Butler batted the ball out of his hands before he could establish possession. Brown kicked a 29 yarder with 1:47 remaining in the game and, once again, it would be a final possession game! Needing a FG to win and under 2:00 to go with no time outs the pressure was on. Brady, who lives for these opportunities, was almost intercepted again but the ball hit the ground. Super Tom completed critical passes putting the Patriots at the Giant 37 with :06 left. Gostkowski was on the spot for a 54 yard game winning kick as NY called time out. The kick was good with 1 second left on the clock…and the Patriots remained undefeated, pulling out a hard fought 27-26 win. Although he was victimized by Beckham on the Giants 1st possession, Malcolm Butler played a solid game. His pass interference penalty was a bad call and he made a great play when he knocked the ball out of Beckham’s hands in the end zone in the 4th quarter. The game ended with the Giants recovering a short kick and trying to pull off the miracle win as they shoveled the ball player-to-player before finally stepping out of bounds. A play-by-play of last night’s nail biter!